As Trump Advisers Come And Go, Mike Pompeo's Star Keeps Rising : Parallels While the president has dismissed several national security advisers, Pompeo's role keeps growing. His secret trip to meet North Korean leader Kim Jong Un is just the latest and most dramatic example. Secretary of State nominee Mike Pompeo answers questions during his confirmation hearing with the Senate Foreign Relations Committee on April 12. Pompeo traveled to North Korea for a secret meeting with President Kim Jong Un at the beginning of the month. The North Korean mission, carried out over Easter weekend, suggests Pompeo is already playing the role of top diplomat even though he's yet to be confirmed by the Senate. By all accounts, Trump and Pompeo have built a close relationship through Pompeo's morning briefings on national security at the White House. "We have a half-hour, 40 minutes every day," Pompeo said in January. "He asks lots of hard questions as any good intelligence consumer would. He's very engaged." Media reports have challenged this scenario, saying the president tends to take a casual approach to his briefings and that the material plays down or avoids matters relating to Russia, which might upset Trump. Still, it's clear the aggressive, hard-charging Pompeo has become a Trump favorite. "With Mike, we've had a very good chemistry from the beginning," Trump said last month. Trump on Wednesday morning confirmed Pompeo's trip to North Korea, saying it bodes well for a possible meeting between the president and Kim. Such a meeting would be the first ever between a serving U.S. president and a leader of North Korea. Last year, Trump and Pompeo both took hard-line positions on North Korea and its nuclear program. Pompeo even suggested he favored regime change. He faced tough questioning last week about his reputation as a hawk when he went before the Senate Foreign Relations Committee. "War is always the last resort," he said. "I would prefer achieving the president's foreign policy goals with unrelenting diplomacy." In his testimony, Pompeo gave no hint that he had been to North Korea only days earlier. He did point to the current diplomatic efforts and said he has "read the CIA histories of previous negotiations with the North Koreans, and am confident that we will not repeat the mistakes of the past. President Trump isn't one to play games at the negotiating table, and I won't be either." The Senate committee is due to vote on Pompeo's nomination as secretary of state in the coming days in what's expected to be a close vote. Pompeo has also been a leading critic of the 2015 nuclear deal with Iran. Next month, the administration faces one of the recurring deadlines over remaining in the agreement. With Trump, Pompeo and new National Security Adviser John Bolton all opposing the deal, it suggests the administration may withdraw its support. Pompeo has a stellar resume, though he's never been a diplomat, either by profession or temperament. He graduated at the top of his class at West Point. He served as a tank officer in Europe. He went to Harvard Law School. He was a corporate lawyer who launched a successful aerospace business. After winning election to Congress in 2010 as a Tea Party Republican from Kansas, Pompeo made his mark as a sharp-elbowed partisan. He was perhaps best known as an outspoken critic of Hillary Clinton and the way she handled the attack on the U.S. diplomatic compound in Benghazi, Libya, in 2012, when she was secretary of state. The U.S. ambassador and three security personnel were killed. "Why don't you fire someone?" Pompeo said at the 2015 congressional hearing. "How come no one has been held accountable to date?" "In the absence of finding dereliction or breach of duty, there could not be immediate action taken," Clinton said. 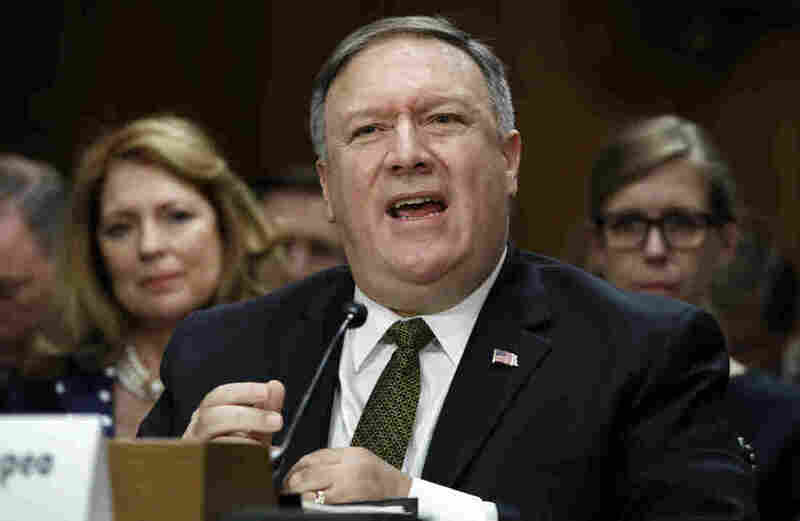 "The folks in Kansas don't think that was accountability," Pompeo said. Trump tapped him to be CIA director last year, and on most issues, they have been in sync. However, Trump has been critical of the intelligence community in general (though not Pompeo) and the president has taken a less critical position on Russia. Pompeo addressed before the Senate committee last week, saying Russia's provocative moves had been "enabled by years of soft policy" by the U.S. — a reference to President Barack Obama's administration. "That's now over," Pompeo added, citing recent actions by the Trump administration that included increased sanctions and the expulsion of 60 Russian diplomats. Pompeo even says the president's less-than-diplomatic tweets — directed at rivals — have worked to the CIA's benefit. "Our adversaries respond to the tweets in ways that were helpful to us — to understand command and control issues, who's listening to what messages, how those messages are resonating around the world," Pompeo said.